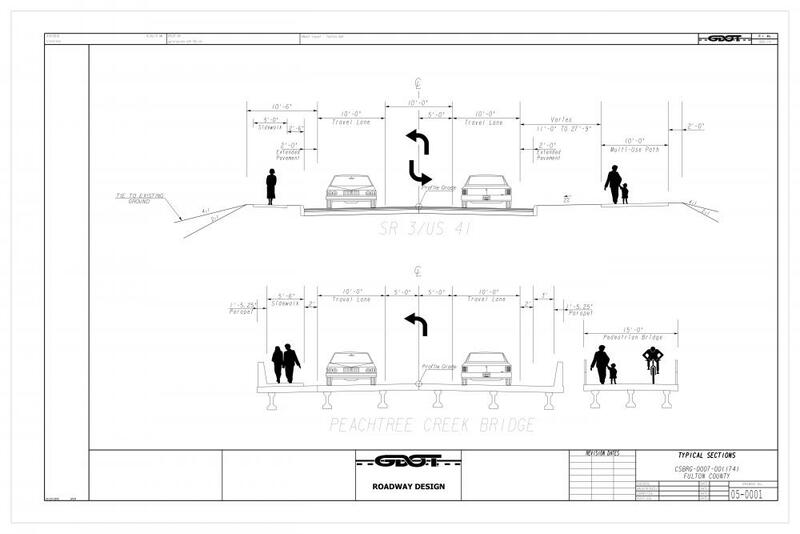 This email is designed to provide information on the upcoming SR 3/US 41/ Northside Drive at Peachtree Creek Bridge Replacement project, scheduled for construction in 2020. The existing bridge was built in 1926, has a low sufficiency rating (41.2 out of 100) and must be replaced. When complete, this project will provide new bridge approaches on Northside and a new bridge over Peachtree Creek. The new bridge will have two 10-foot lanes, a 10-foot left turn lane, a 2-foot shoulder, 4-foot bike lane, a 5-foot sidewalk on the western side from Wesley Drive to the bridge, and a 5-foot shoulder on the eastern side. 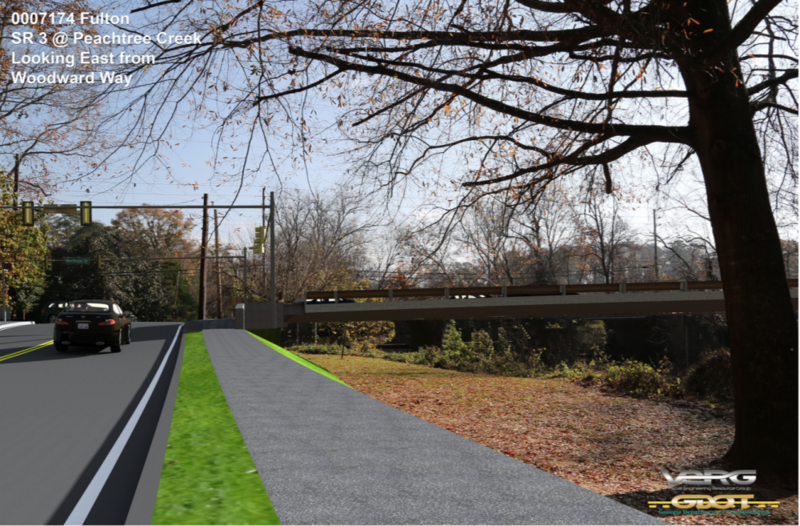 A 15-foot pedestrian bridge will be constructed next to the new bridge on the road’s eastern side, to connect to the existing multi-use paths in Atlanta Memorial Park and Bobby Jones Golf Course to the Peachtree Creek Trail. This construction will require installation of a traffic detour in 2020, which many of you have learned from the project public involvement efforts. This correspondence is to provide you advance notice that significant utility relocations must occur in the area this spring to avoid work delays and compounded traffic impacts for next year’s bridge construction. Within the next two weeks, lane closures will be installed on Northside Drive to allow Georgia Power, several other utilities and the City of Atlanta Dept. of Public Works (tentatively) to relocate their underground facilities in the project area. These lane closures will help keep workers and drivers safe, provide space for large equipment on-site and allow optimum work hours. Phase 1 – mid-March to end of March. Weather permitting, vegetation clearing will begin on Monday, March 11 to remove trees that overhang the existing Peachtree Creek bridge that would obstruct construction of the two new bridges to be built next year. The clearing activities and related single lane closure will last for about 14 days in the northbound lane of Northside Drive in the area before the bridge to the end of the project. Phase 2 – end of March through Memorial Day. Following the clearing, Georgia Power will lead off the cascade of utility relocations beginning late March. Because of the large equipment needed for the work, crews will close the northbound lane and one turn lane on Northside in the project area until Memorial Day. Flaggers and signage will guide drivers through these closures. Georgia Power also suggests that a temporary detour may be needed for a few days to reach the power pole on the northeast side of Sagamore Drive and Woodward Way, because their large, heavy equipment can’t sit safely on the bridge culvert. During both phases, lane closures would be in place weekdays from 9:00 a.m. until 4:00 p.m., but a weekend work schedule is still under consideration if needed to complete this work on-time. GDOT will provide regular updates on the closures. We encourage you to share this information with your constituents and visitors. Please alert them to allow extra travel time as they drive through the lane closures within and around the project area. 1) Create a coaltion of neighborhoods to address the detours and effects of the 90 day closure of Northside Drive at Peachtree Creek. 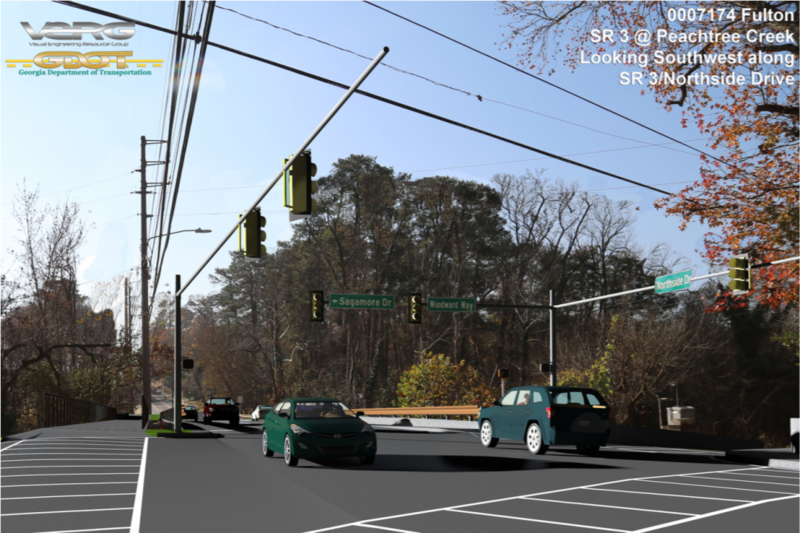 A loose alliance of the following organizations was formed for the purpose of dealing with issues relating to the closing of Northside Drive in connection with the replacement of the bridge over Peachtree Creek. The following organizations comprise that alliance: Atlanta Memorial Park Conservancy, Ardmore Park Civic Association, Brandon Civic Association, Castlewood Civic Association, Channing Valley Civic Association, Collier Hills Civic Association, Collier Hills North Civic Association, Habersham Park Civic Association, Memorial Park Civic Association, Peachtree Battle Alliance, Peachtree Heights West Civic Association, Springlake Civic Association, Wesley Battle Civic Association and Wildwood Civic Association. A meeting of this alliance was held at the home of Sadler Poe at 6:00 PM on January 23, 2019. The following persons attended: Erin Bailey (Springlake), David Gylfe (Collier Hills), Michelle Hatch (Channing Valley), Elenor Klingler (Castlewood), Nolan Leake (Peachtree Heights West), Roger Moister & Susan Moody (Collier Hills North), Whitney Paulowsky (Brandon), Claire Stroud (Ardmore Park), Reggie Williamson (Habersham Park), Garth Peters (Memorial Park) and Sadler Poe (Peachtree Battle). Current goals include identifying intersections that can be improved with left turn signals and extended left turn lanes, work with USPS, FedEx, UPS, City of Atlanta Office of Solid Waste Services to limit pick up and deliveries during peak traffic periods. Sadler is also trying to arrange meetings with the City’s traffic committee and identify a representative from our neighborhood to attend the meetings of the City’s Traffic Committee, chaired by Andre Dickens. Another suggestion is to reach out to the at-large council members: Andre Dickins, Michael Julian Bond and Matt Westmoreland. 2) Creation of a subcommittee of the PBA Traffic Committee to work on this project by monitoring progress, communicating with GDOT and other city officials and communicating with our neighborhood for the duration of the project. Additionally, at least one member of this committee will liaise with local media outlets to keep the broader public aware of detours. This webpage is intended to have the most up-to-date information available at all times. There will be a link on our homepage, directing you to the bridge updates, when work on the bridge begins. If you are interested in being a part of this important subcommittee, please click HERE. 3) Push GDOT to agree to a bridge design that will have a barrier between the pedestrian sidewalk and the southbound traffic lane over the bridge. Currently GDOT is not willing to allow for a barrier between the south bound traffic lane of Northside Drive and the pedestrian sidewalk on the west side of the new bridge. Sadler Poe and Catherine Spillman (Atlanta Memorial Park Conservancy) have scheduled a meeting with GDOT's project manager to discuss the issue, and will pursue a solution with state and local elected officials. 4) Work with our own PBA Security officers and the APD to plan for potential intersections which may need a police presence and possible traffic directing during the bridge closure. GDOT now says that construction of the bridge and the resulting closure of Northside will start in the summer of 2020. The latest communication from GDOT says the bridge will be constructed on a 24/7 basis, and there is no longer a contingency for their being able to find a contractor that will do the work within their budget. 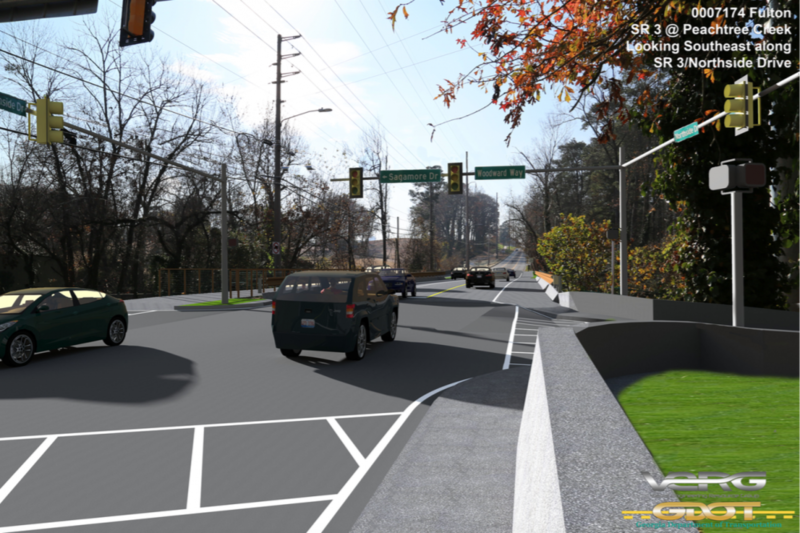 Thanks to the cooperation from GDOT and savings on the Woodward Way trail, the PATH Foundation and AMPC are moving forward with their goal to provide a pedestrian underpass under the new Northside Drive bridge. GDOT shared that a barrier between the roadway and 5’5” sidewalk on the new Northside Drive bridge was not going to be possible while keeping the bridge on budget and on schedule. Attendees at the meeting asked GDOT to look into adding a higher curb and hand rail in lieu of a barrier but GDOT stated the hand rail would not be part of this project for the reasons of adding a false sense of security and additional maintenance. AMPC will continue discussions with GDOT on how to provide a separation between vehicles and pedestrians on the vehicular bridge. 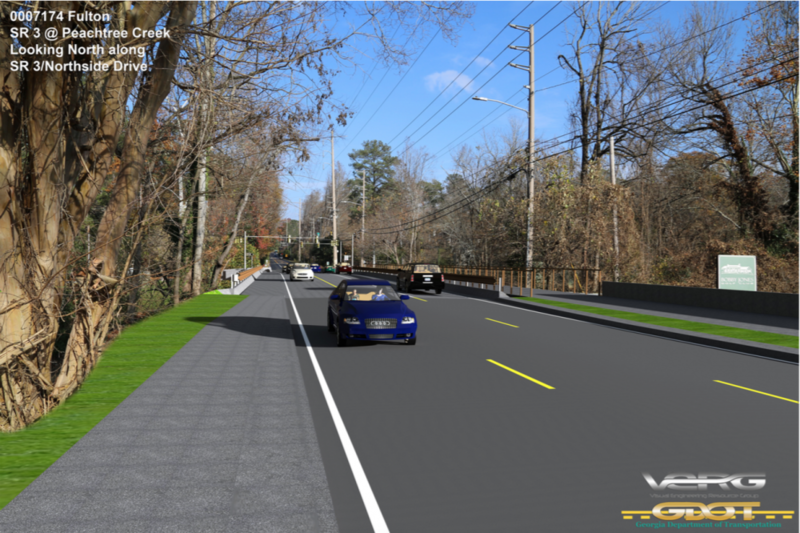 GDOT clarified that the sidewalk on the west side of the vehicular bridge will be connected to the future Memorial Park sidewalk. The pedestrian bridge construction is estimated to commence in Q1 of 2019, with the vehicular bridge construction to commence in 2020. 24/7 work has been approved during the road closure portion of the reconstruction which will bring the duration of the road closure down to 3 months (90 days). DWM is commencing work on several projects in the park, including the $36M Peachtree Creek Trunk Stabilization Project and the $8.6M Howell Mill and Oldfield Outfalls Project (to remove the sewer pipes crossing Peachtree Creek). To view DWM's slide presentation from June 7, 2018, click here. According to a GDOT official, about 225 people attended the open house. Over 72 written comments were received and about 10 given to the court reporter. GDOT may be able to reduce the time of closure to 90 days or less if work proceeds 24 hours a day, 7 days a week. Approval to do this is based on 1) consent from the City and 2) GDOT being able to secure a 24/7 contract that is within budget. PBA is doing everything possible to help facilitate this effort. When you send in your comments, we encourage you to tell GDOT you want to fast track the project. GDOT is aware of the concern over the lack of barrier/protection for pedestrian traffic on the west side, 5' sidewalk on the bridge - feel free to mention this concern in your comments. GDOT is reviewing all comments received.